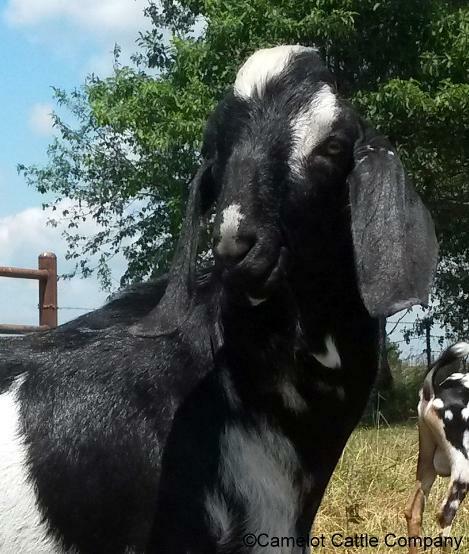 Nubian Info: We keep a small herd of ADGA Purebred Registered Nubian goats. We test annually for CAE and have herd-wide negative results every year. We don't have any chronic or contagious health problems in our herd. We practice strict bio-security to keep it that way. Our entire herd is G6S Normal either by DNA test or by parentage. We participate in linear appraisal and DHIR. Our goats have access to fresh browse and home-grown grassy alfalfa/clover hay at all times as well as organic kelp and loose minerals. Our kids are bottle raised on our raw whole Jersey milk and coccidia prevention. 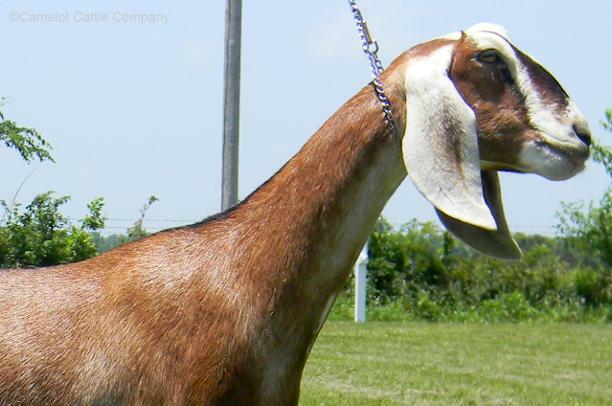 Showing: While we do have show quality goats, we refrain from showing them ourselves. We feel showing is not best for our herd's health which is a top priority for us. In addition, ADGA doesn't consider show wins in their data for genetic evaluations for a reason; show results are subjective. At shows your animal is only compared to the other animals who happen to show up at that specific show, not compared to the actual breed standard as it is in Linear Appraisal. 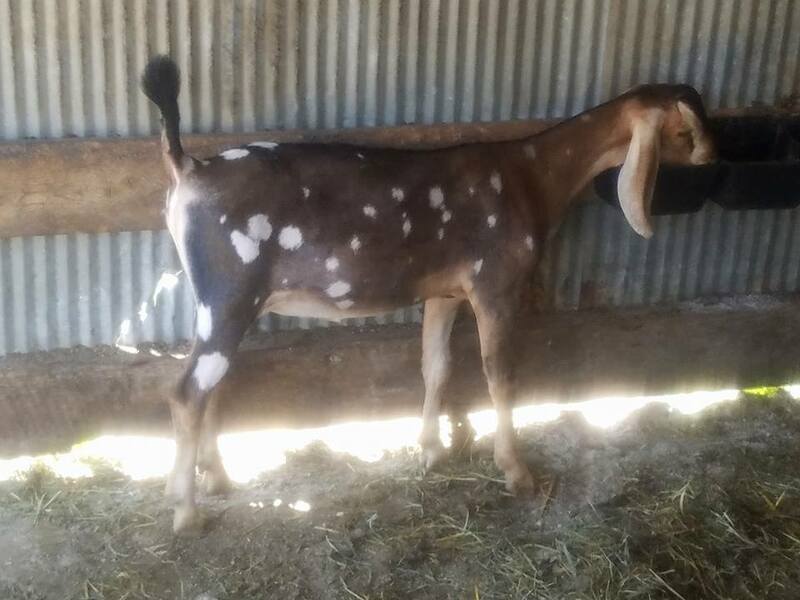 So, while we love seeing goats showing well, we prefer to use Linear Appraisal and DHIR to record our goats' quality and at the same time keep our goats from being stressed or exposed to other herds. Visitor Information: Please call ahead to be sure we will be available to meet you as we do keep a busy schedule. For bio-security purposes, we also ask that when you visit, you refrain from wearing your regular barn boots and barn outerwear. Please wear clean shoes/boots and clean jeans/outerwear that you have not worn in any barn or around any other animals please. You will NOT be permitted inside the pens with the animals at any time. We will bring the animal(s) that you may be interested in out of the pen for your closer inspection. Thank you for understanding! 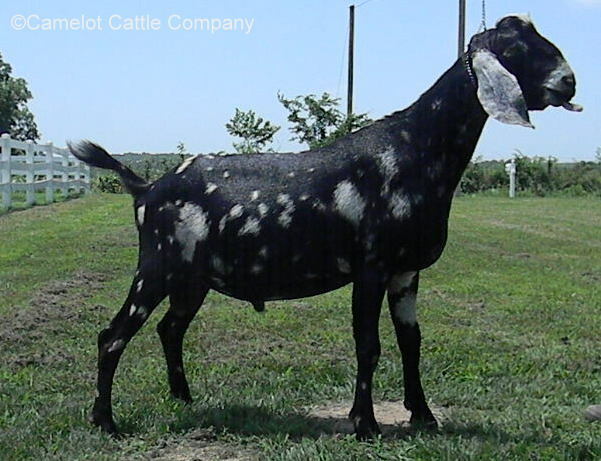 We are a Certified Dairy Goat Quality Producer through Langston University and have been a longtime ADGA member. 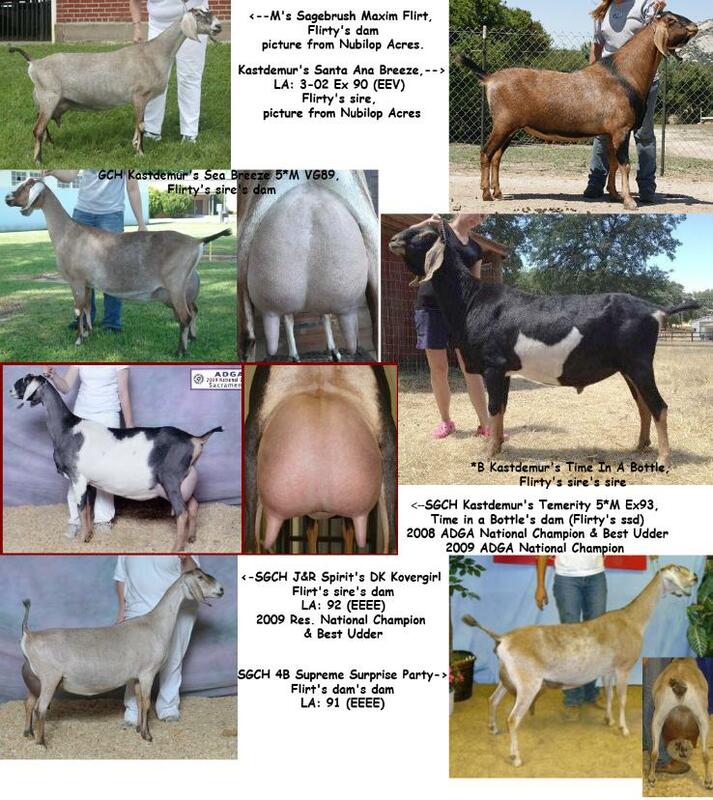 We have some of the best Nubian bloodlines for milk and show with lines from all over the United States. We take pride in breeding for outstanding breed character on strong, healthy, dependable dairy animals with steady, calm, affectionate dispositions, low input/high output conversion, and longevity. All of these positive traits make for productive, show quality dairy animals that last. 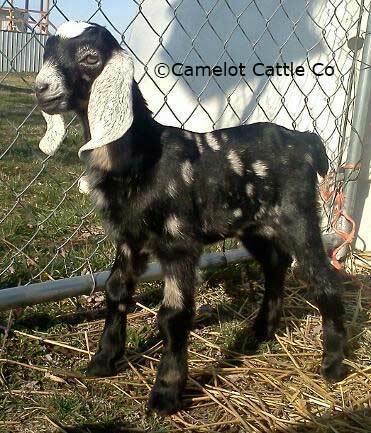 So, whether you are looking for show or just quality dairy animals, consider a Camelot Cattle Co Nubian! 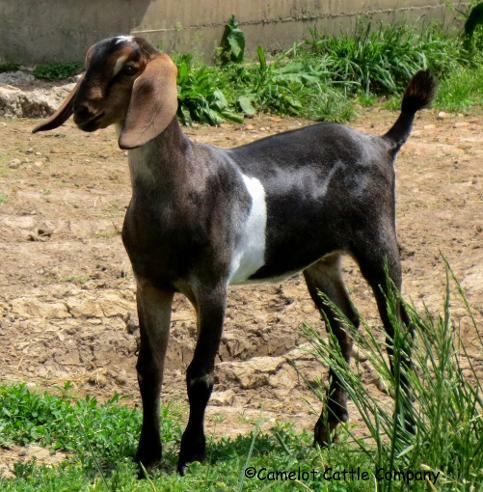 As you peruse our wonderful Nubians, note that each goat has their own section. 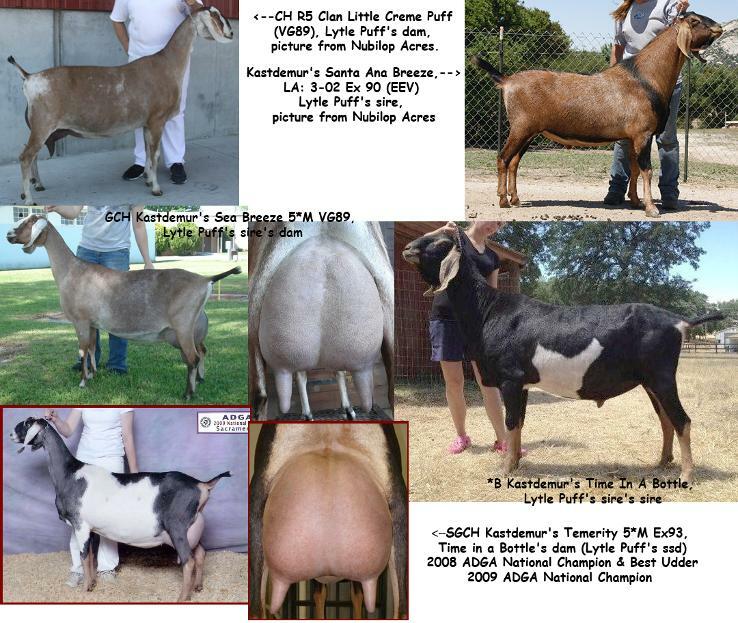 In each doe's section you will find information such as pedigrees, production and appraisal records, reserved kid prices and breeding information. The does are listed by age, oldest first and getting younger as you scroll down, then the bucks are listed next with their appraisal records and information. 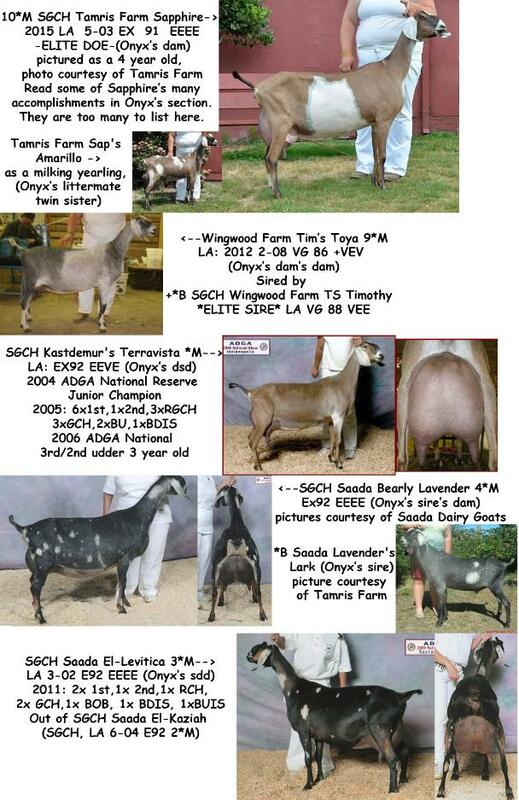 I have included references with each goat if we don't own the sire, dam, etc. That said, don't forget to refer to the impressive sires, dams, etc that we do own or have owned in their own sections. 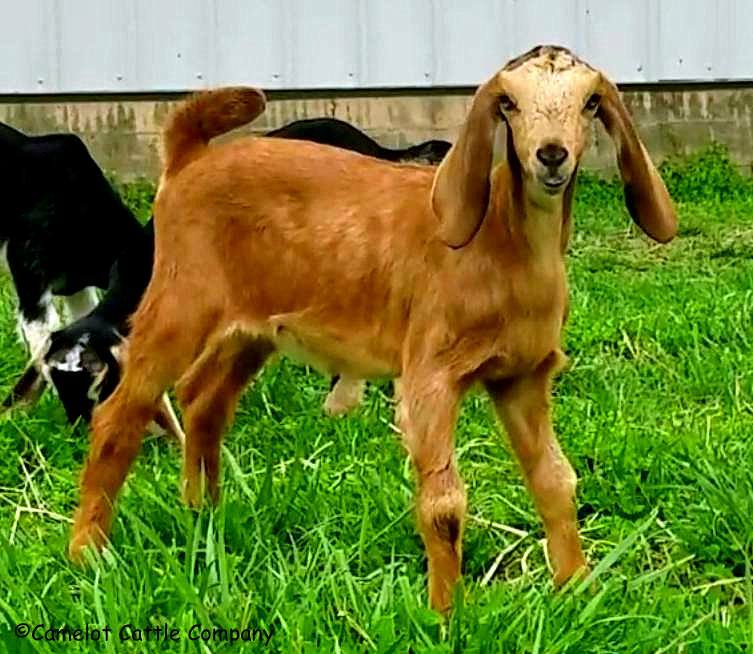 Interested in purchasing one of our goats or reserving a kid out of our does? Click here to see our purchase/reservation information. 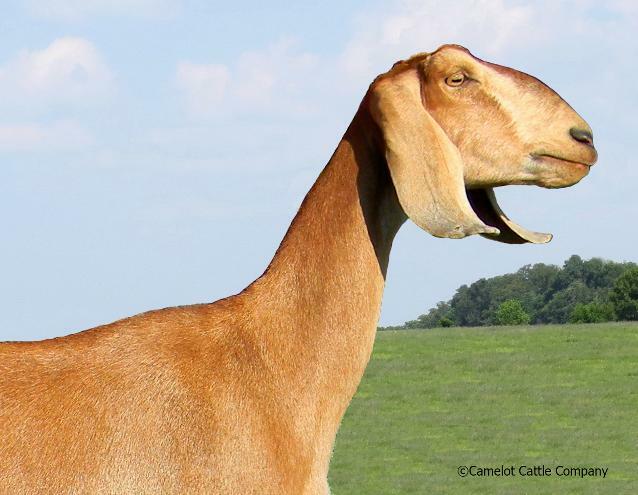 Lytle Puff is such a lovely doe, so long and tall and very dairy with beautiful long, bell-shaped ears. 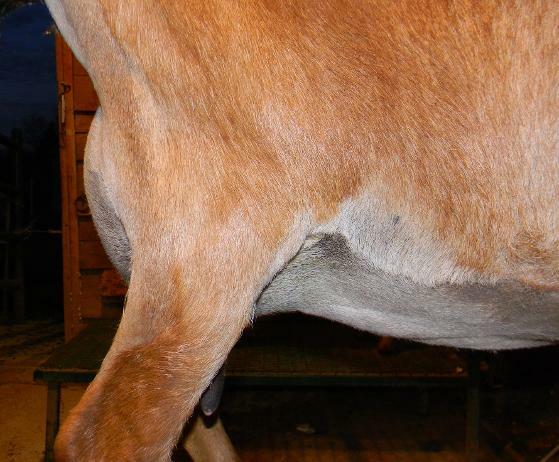 She has a long, dairy neck that ties in beautifully with her withers and moves into a long topline and wide rump. Good depth of body and nice brisket, standing on correct legs and feet. She has a high, wide escutcheon and all with that beautiful strawberry blonde silky coat...I could go on and on about this lovely girl. Her mother is one of the nicest does we've ever seen, a permanent champion and several Best of Breed wins as well as Best In Show. She scored excellent in body capacity and mammary. Puff's sire speaks for himself scoring EX-90...Lytle Puff is a fantastic addition to our herd! 2015: Puff freshened 3-16-15 with beautiful twin doelings sired by Kiko. 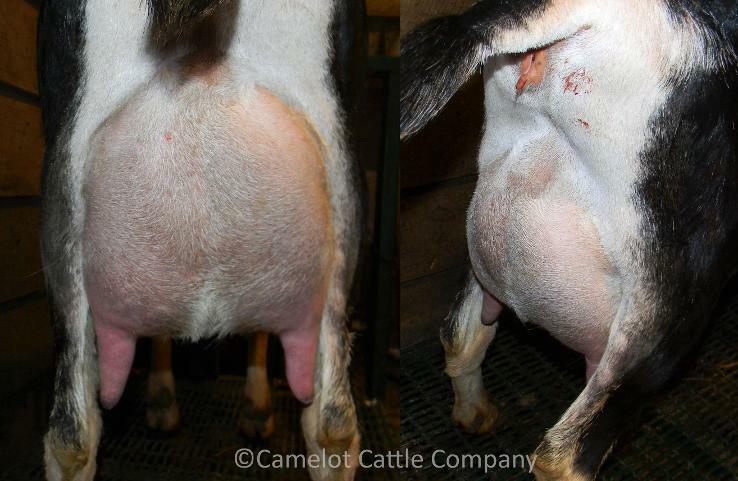 Puff has a lovely, well-attached udder with well placed teats and nice foreudder. 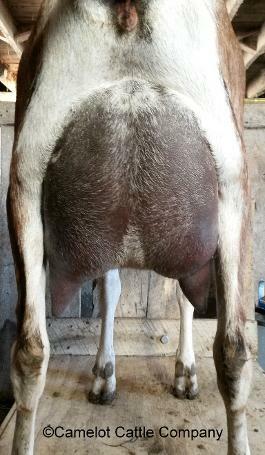 Her rear udder is so high, wide and round, it really pops. She is a dream to milk with excellent udder texture like warm butter that milks out quickly through perfect orifices. She gave over 9 pounds a day as a first freshener...we are very pleased with her! 2016: Puff freshened 3-14-16 with triplet bucklings sired by Camelot Cattle Co Chrome. They are the loveliest kids we have ever had and it's hard to believe but her second freshening udder is even better than her first! During her peak she milked 10 lbs and she is a very consistent milker without much drop from peak through the year. Puff appraised this year at VG88 with an Excellent in Mammary (VVVE) as well as Excellents in front legs and udder texture. 2017: Puff was bred to Chrome and had lovely triplet doelings on March 13, 2017 and she looks fantastic! She milked 10.6 lbs on her first 2017 milk test at just 11 days fresh and qualified for her milk star in milk, fat, and protein easily her first lactation on DHIR. Her 2017 appraisal shows her being Excellent in Dairy Strength and Mammary with Very Good General Appearance with a Final Score of VG89. 2018: Puff was bred to Tolkien for 2018 and had beautiful quads on February 26; 2 doelings and 2 bucklings. She freshened in with her lovely, productive, superb quality udder as usual. First 2018 test shows her milking 11.4 lbs and peaking at 12 lbs. She looks fantastic but unfortunately ADGA wasn't able to accommodate our herd for the 2018 season so we don't have new linear scores this year. 2019: Puff was bred to Moose for 2019 and had beautiful triplets on March 3; 2 bucklings and 1 doeling. She freshened, as always, with her beautiful, buttery soft, quality udder and solid production. Her three first freshening daughters this year all inherited her lovely mammary. We couldn't be more pleased with Puff's transmitting abilities! 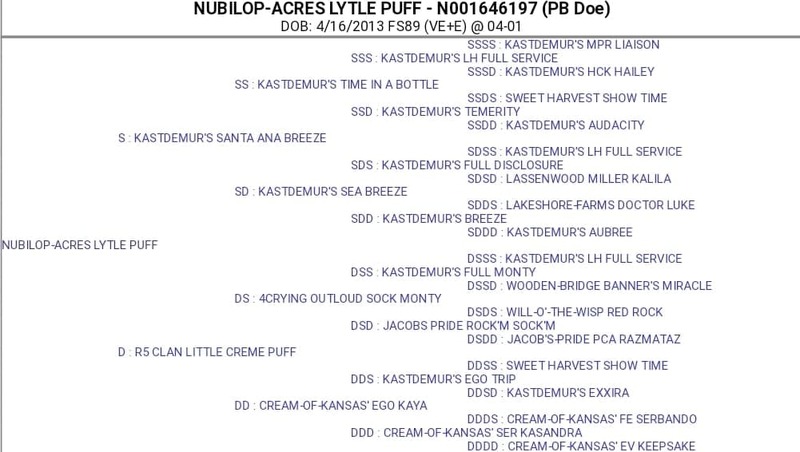 Puff will be bred to *B Camelot Cattle Co Mordecai for 2020 kids. Puff in April 2017, as a 3rd freshener showing full and milked out. Puff pictured as a 4 year old. Flirty is a lovely, showy doe with very good general appearance, excellent dairy strength, correct build and nice straight legs. She is long, has nice depth and a beautiful topline and level rump. She is wide throughout her body and has a nice high, wide escutcheon. She is out of a slower maturing line but we love the looks of her and with her lovely dam (who has a senior Res. Champion under her belt and has scored excellent in dairy strength and mammary) and her sire (EX-90) we are very excited to watch this doe mature! Flirty is pictured above as a dry yearling. 2015: Flirty was bred to Chrome for May 2015 kids and gave us gorgeous, correct twin doelings. 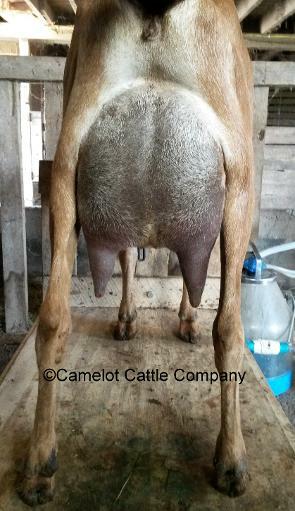 As a first freshener, she milked about 7.5 pounds a day and milks out very nicely from a nice, balanced udder. 2016: Flirty had triplets sired by Onyx on March 18, 2016. She had two bucklings and a doeling. The doeling is being retained. 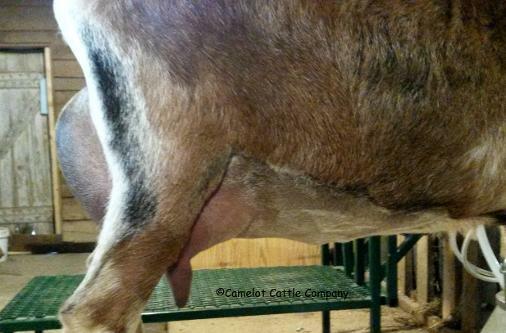 Flirty's udder has matured nicely this lactation and during her peak milked 12.5 lbs! Flirty also appraised this year as a second freshening 3 year old at VG88 with an Excellent in Dairy Strength (VEVV) as well as Excellent in shoulder assembly. 2017: Flirty was bred to Draco and gave us beautiful triplets on March 1, 2017; two doelings that are being retained and a buckling that went to work in another herd. Flirty's first 2017 milk test shows her milking 12.2 lbs at just 23 days in milk and she milked 12.8 lbs her next test. Flirty more than earned her milk star in milk, fat, and protein the first lactation on DHIR. Flirty is the epitome of low input/high output. Her 2017 appraisal lists her In structural categories she as Excellent in Shoulder Assembly, Front and Rear Legs, and Back. She is Excellent in Dairy Strength and General Appearance and Very Good in Body and Mammary with a final score of VG89 (EEVV). 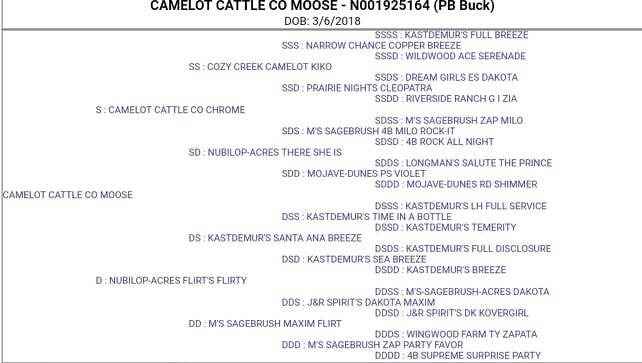 2018: Flirty was bred to Chrome for March 2018 kids and had gorgeous triplets, 2 bucks and a doe. She is being her usual productive self with her first 2018 test showing 13 pounds and peaking at 14 lbs a day. 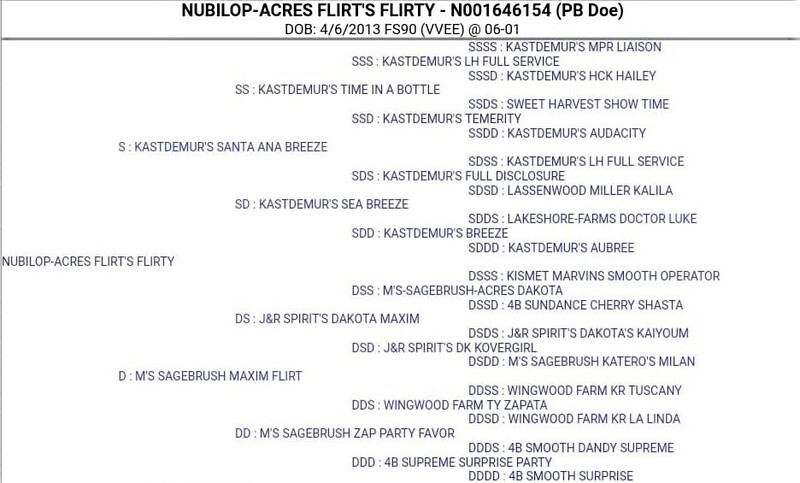 We received word that Flirty's 2015 doe by Chrome is milking 13 pounds as well this year. 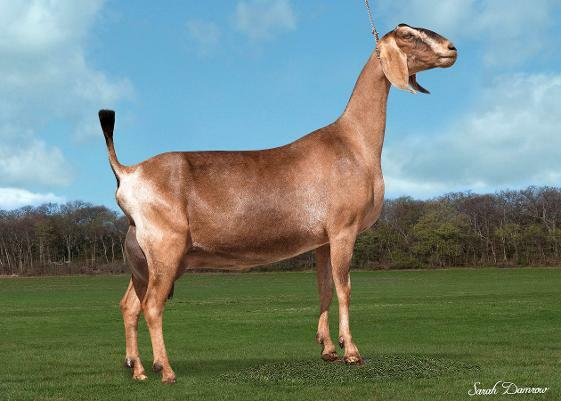 We are looking forward to seeing what our retained 2018 Flirty x Chrome doeling can do. Unfortunately, ADGA wasn't able to accommodate our herd for the 2018 season so we don't have new linear scores this year. 2019: Flirty was bred to Onyx for 2019 kids. She gave us a big beautiful set of triplets on March 5; 2 doelings and 1 buckling. This same breeding 2 years ago produced our lovely Mischief whose 305 ME as a first freshener was over 3500 lbs and they don't come any typier! Flirty will be bred to *B Tamris Farm Sap's Onyx for 2020 kids. Flirty as a second freshening 3 year old at 5 days fresh with almost 12 hour fill. Flirty's first freshening udder at about 4 weeks fresh. We had not planned on adding another mature doe but when the opportunity came to buy MeMe in January 2018, we jumped at the chance to add this lovely, sweet girl. She is a very strong built doe and should appraise very well in Dairy Strength. She has length and width and dairy character in spades. 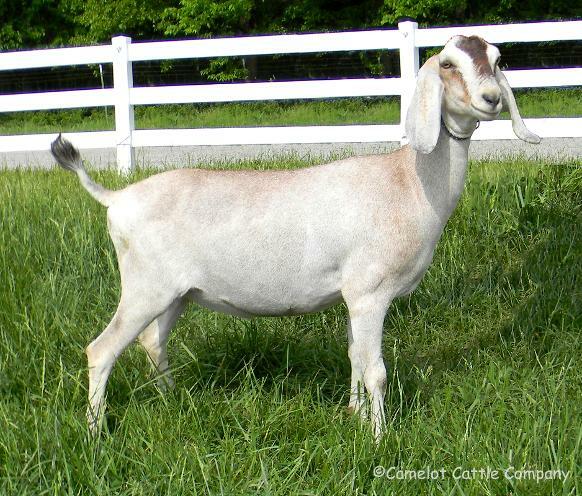 She has a long, graceful neck and a feminine, yet very Nubian head with lovely ears. 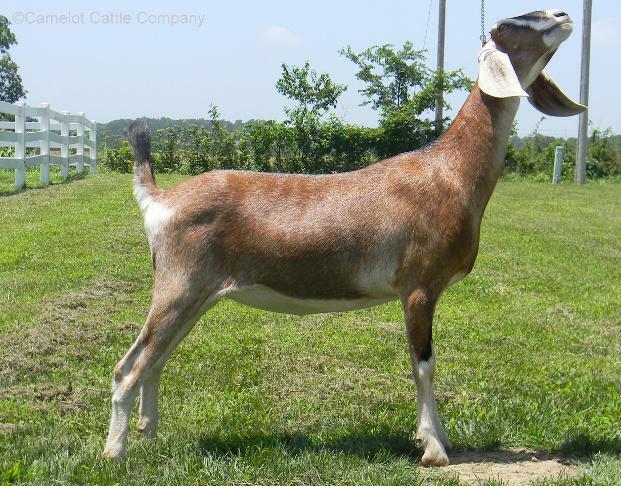 Her previous owner showed her at the SMDGA Show in Sedalia as well as the Quad State Classic Dairy Goat Show in Iowa. She took Reserve Senior Grand Champion at both shows. 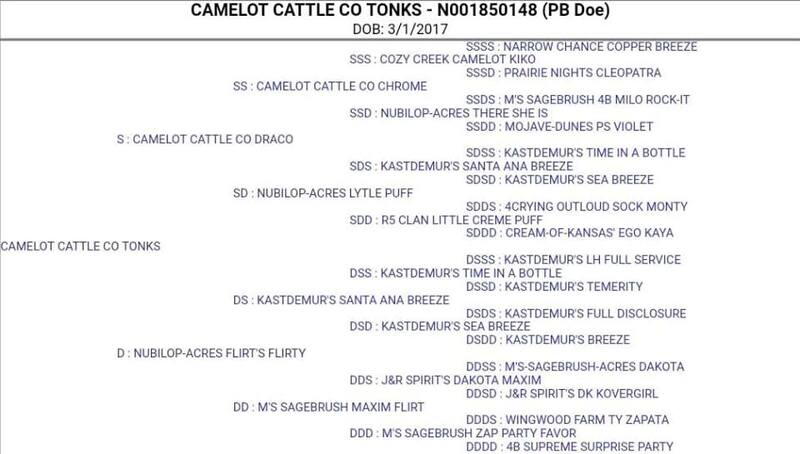 She is out of the same dam as our wonderful Puff and is the dam of our handsome Tolkien. We knew there was no way we weren't going to love MeMe and we were right! MeMe is pictured just before she turned 4 on her fourth lactation. 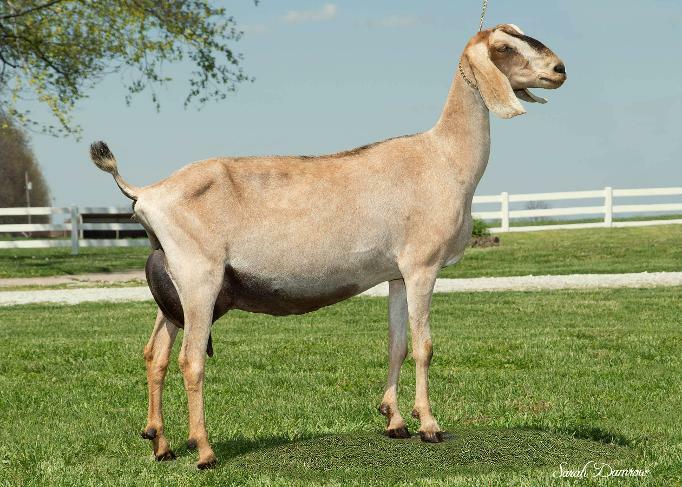 MeMe was bred to M*L Legacy Sweet Sensation, the full brother to the 2016 ADGA National Champion, CH Canoe Creek Victoria. She had quads March 13, 2 does and 2 bucks. MeMe peaks at 13 lbs a day and easily earned her milk star just 140 days into her first lactation on test. Unfortunately ADGA wasn't able to accommodate our herd for the 2018 season so MeMe will have to wait until next year to receive a linear score. 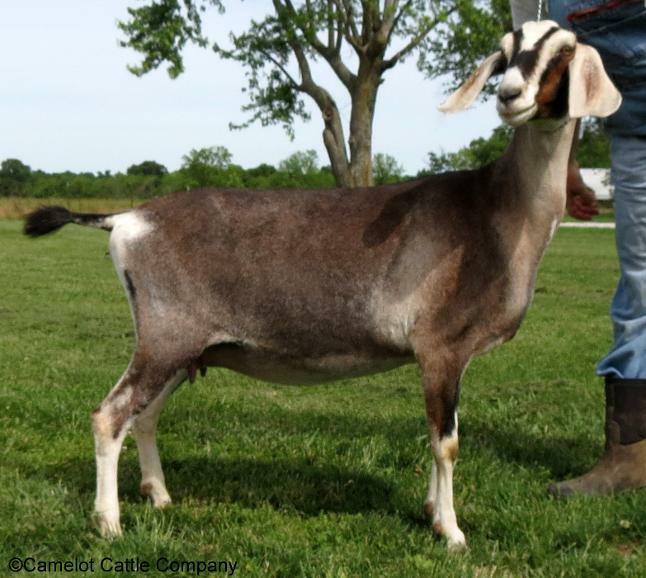 MeMe was bred to Calvin for 2019 and she had lovely triplets in March, a doeling and two bucklings. The doeling will be retained for our herd. Dahlia is a gorgeous black roan with brown trim, moonspots and big white splashes, her breed character is impressive with the best roman nose we've ever seen at birth and lovely bell shaped ears. She has length, width, and very good body capacity. With the pedigree behind her along with her dam's fantastic udder and ability to milk (10+ pounds per day as a 2 year old)...Dahlia is being retained. 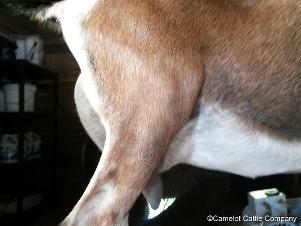 :) Her dam, There She Is, has a very well attached udder with a lovely, long fore udder and a high, wide rear udder. She milks out quickly and down to nothing with wonderful udder quality. She is out of one of the best looking does we've ever seen (Mojave-Dunes PS Violet) who became a permanent champion early in the 2013 show season with 2013 show records including 4X Senior Champion, 1X Reserve Sr. Champion, 6X Best Of Breed, 1X Best Udder Of Breed and 1X Best Doe in Show. She scored excellent in dairy strength, body capacity, and mammary with overall score of EX-90. There She Is's sire's dam scored EX-92 (EEEE) as a 4 year old. 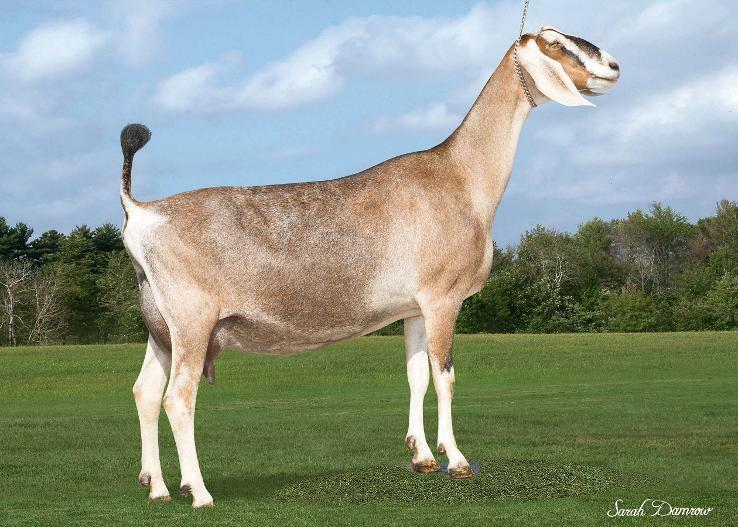 Then, of course, Dahlia's sire, Kiko, who scored EX-90 and always gives us wonderful kids and has his own claim on beautiful, productive goats. Dahlia's full brother is our very own wonderful Camelot Cattle Co Chrome V87 who has been putting some very nice kids on the ground. We are very excited about Dahlia! Pictured above as a second freshener. Dahlia was bred to Onyx for 2017 kids and freshened on Feb 24 with beautiful twins, a buckling and a doeling. She freshened with a lovely, well attached udder that high and wide with a long, smooth foreudder. She milks out quickly and easily with fantastic dairy quality to her udder. She milked 7 pounds and earned her star as a first freshener. Her 2017 appraisal lists Very Good Front and Rear Legs and Feet, Udder Texture, and Dairy Strength with a Final Score of 83. Dahlia was bred to Onyx for March 2018 kids and had lovely twin doelings. 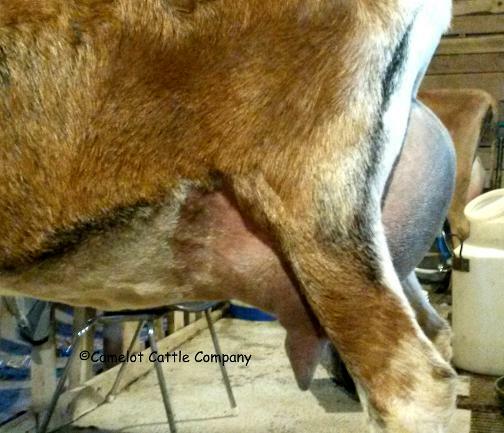 Her udder capacity has increased nicely her second lactation and she milks out fast with amazing dairy quality. Dahlia started off her first 2018 milk test with 10.8 pounds, peaking over 11 lbs a day. Dahlia looks phenomenal this year but unfortunately ADGA wasn't able to accommodate our herd for the 2018 season so she won't be getting a new linear score until next year. Dahlia was bred to Onyx for 2019 and she had gorgeous, flashy triplets in March. 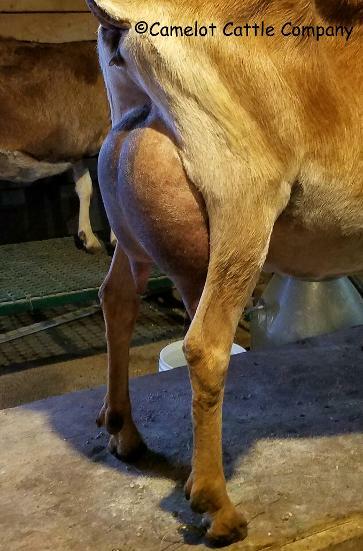 Her udder has matured nicely this year; she is just looking lovely! Her first milk test at just 13 days in milk shows her milking well over 11 lbs. 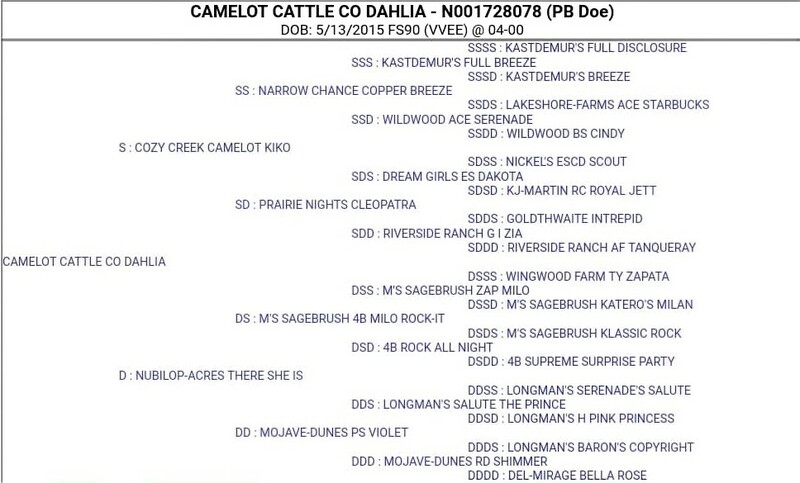 Dahlia will be bred to *B Camelot Cattle Co Dante for 2020 kids. Dahlia's first freshening udder in March 2017. Dahlia at about 3 months of age. This sweetheart was out of Flirty's 2016 triplets and sired by Onyx. Mischief (aka Missy) is a beautiful, correct, elegant doeling and we can't wait to see the productive udder she puts on...she should really milk with her dam and sire being who they are. Just loving her deep chocolate roan with just a little splash of color. She has lovely dairy skin and so long! Long level topline going into a long level rump and long flat-boned legs...she is just fantastic. Pictured as a dry yearling. Missy was bred to Draco and had beautiful twins on March 12, 2018. One doe and one buck. We are very pleased with her first freshening udder as well with a socked-on mammary system that milks out very quickly. Very smooth, long fore udder and high, wide rear udder with nice teats...and attachments to spare! She certainly has the genetics to be a top producer and she started off her very first 2018 test wonderfully milking 8.4 pounds as a first freshener just a couple of weeks fresh. She then continued on a steady curve and at 141 days into her first lactation she earned her milk star and still peaking, milking 11.4 lbs. Missy's 2018 305 ME was over 3500 lbs which is easily within Top Ten range as a first freshener. She is the kind of doe that I wouldn't mind having a whole herd of. She obviously has a will to milk, she is very quick and easy to milk out and she is a low maintenance doe. On top of that, she looks absolutely fantastic! Unfortunately ADGA wasn't able to accommodate our herd for the 2018 season so she won't be getting a linear score until next year. 2019: Missy was bred to Calvin for 2019 kids and had lovely triplets; two bucks and a doe. We are retaining a buck for our herd. She freshened with that same socked on, productive udder as last year and we are excited to see what she can put in the bucket this year! 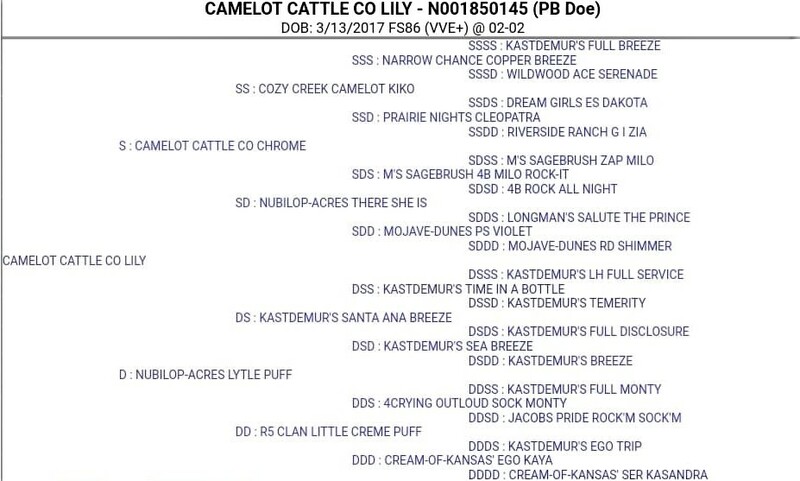 Missy will be bred to Camelot Cattle Co Chrome for 2020 kids. Missy's first freshening udder at 13 days fresh. Some candids of Missy as a first freshener. Missy at about 7 weeks. This was a repeat breeding since last year we got a litter full of beautiful bucklings but we wanted a doeling to retain. 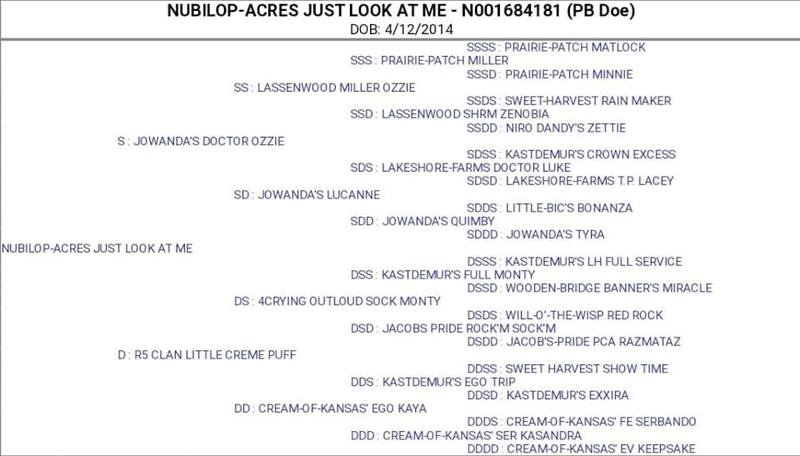 Puff cooperated this year and gave us triplet doelings...we took full advantage and retained all of them! 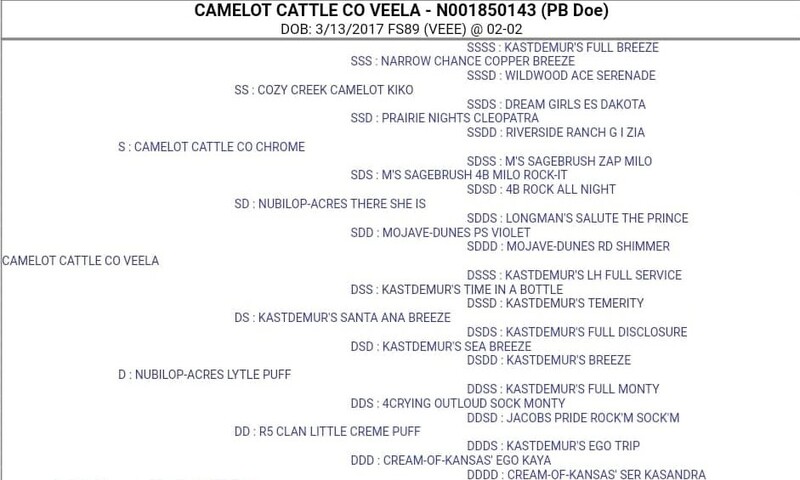 Veela is out of our wonderful Puff, sired by Chrome. Veela is beautiful, correct, elegant and should put on a lovely productive udder with her genetics. Can't wait to see this girl mature! She is pictured as a yearling. 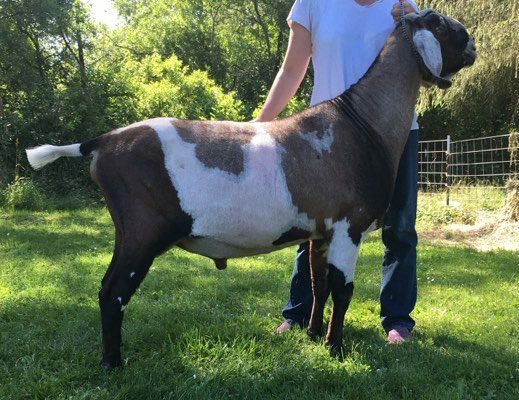 Veela was bred to Calvin for 2019 kids and had gorgeous triplets on March 28. Her first freshening udder is phenomenal with lovely dairy quality, well-placed teats, wonderful attachments, and plenty of capacity. 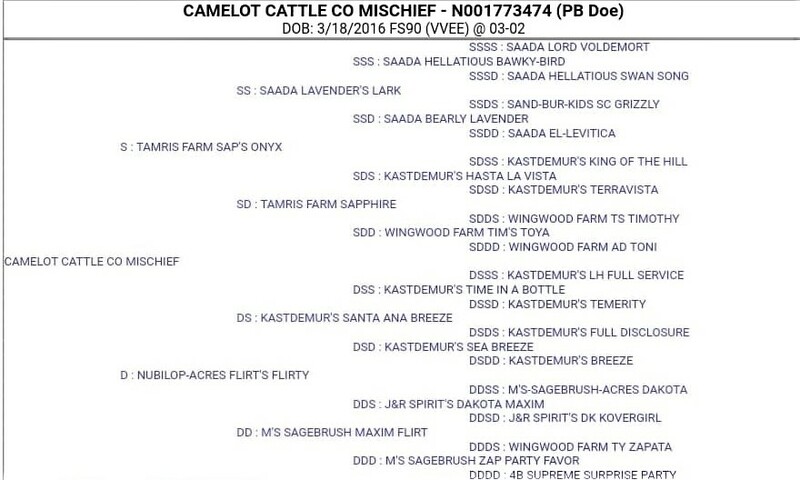 Veela will be bred to *B Camelot Cattle Co Dante for 2020 kids. Veela's first freshening udder just 6 days fresh. This was a repeat breeding since last year we got a litter full of beautiful bucklings but we wanted a doeling to retain. Puff cooperated this year and gave us triplet doelings...we took full advantage and retained all of them! Lily is out of our wonderful Puff, sired by Chrome. Lily is beautiful, correct, elegant, and has the longest, prettiest ears of any kid we've ever had! She should also put on a lovely productive udder with her genetics. Can't wait to see this girl mature! She is pictured as a yearling. Lily was bred to Tolkien for 2019 kids and had lovely twins on March 26; 1 buck and 1 doe. Her first freshening udder is just lovely with great attachments, capacity, and quality texture. We are very pleased with her. 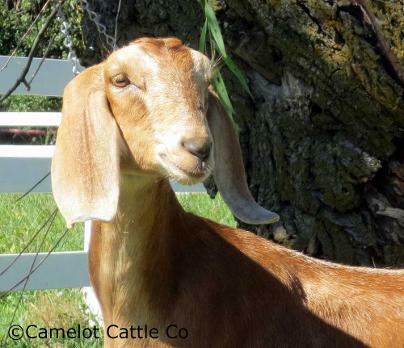 Lily will be bred to *B Camelot Cattle Co Mordecai for 2020 kids. Lily's first freshening udder at just 8 days fresh. This was a repeat breeding since last year we got a litter full of beautiful bucklings but we wanted a doeling to retain. Puff cooperated this year and gave us triplet doelings...we took full advantage and retained all of them! 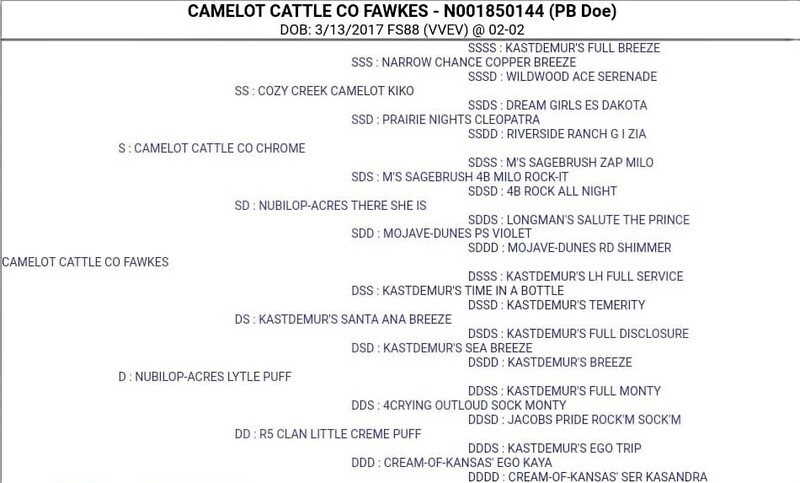 Fawkes is out of our wonderful Puff, sired by Chrome. Fawkes is beautiful, correct, and has surprising width and strength throughout. She should also put on a lovely productive udder with her genetics. Can't wait to see this girl mature! Pictured right at 1 year of age. Fawkes was bred to Onyx for March 2019 kids and she had beautiful triplets; two does and a buck. Her first freshening udder is absolutely lovely with the same amazing quality to it as her dam. 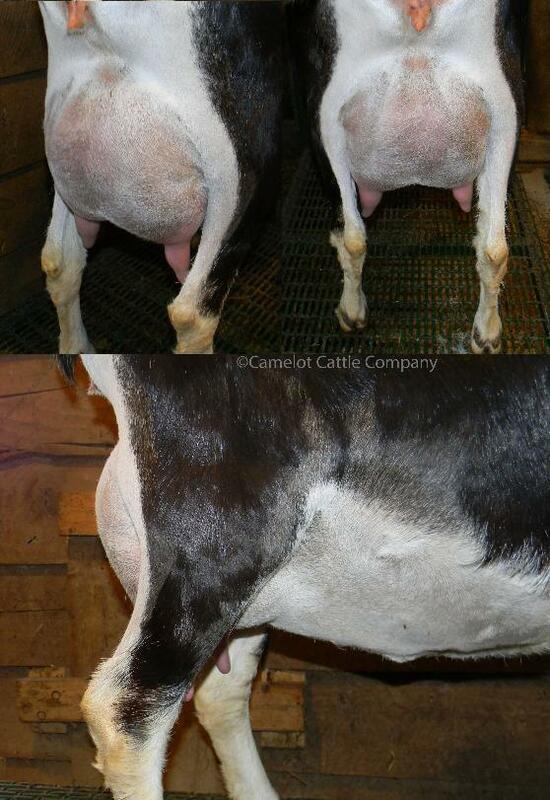 Her udder has wonderful attachments and ideal teat size with nice placement. Her production is respectable for a first freshener as well with her first test at just 11 days in milk showing her milking 6 lbs. 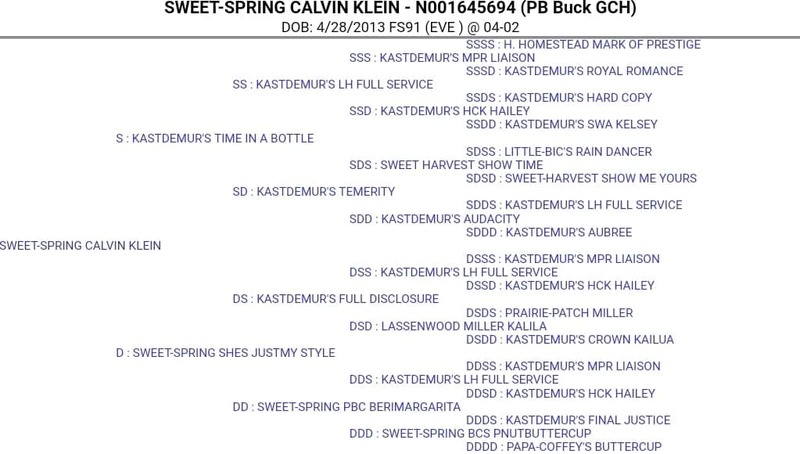 Fawkes will be bred to +*B Sweet-Spring Calvin Klein for 2020 kids. Fawkes' first freshening udder at just a few weeks fresh. Fawkes at about 2 weeks of age. 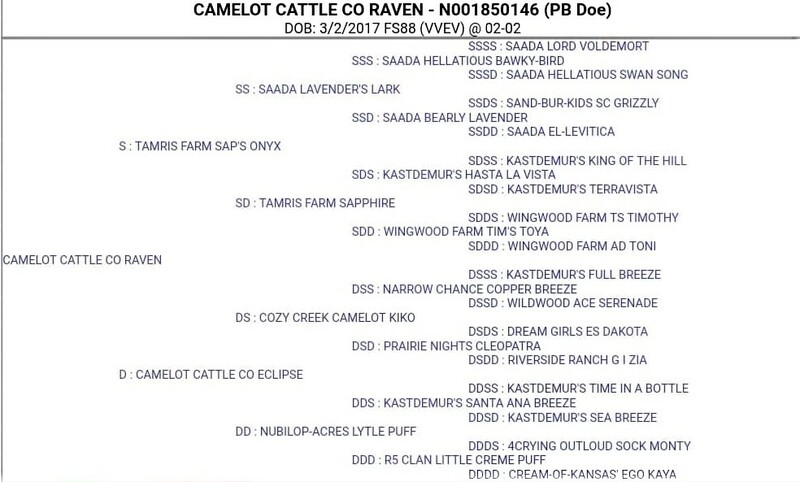 Raven is out of Eclipse, daughter of Puff, and sired by Onyx. We hadn't planned to retain anything out of Eclipse's triplets since she had full reservations but we couldn't help but hang onto this girl. Raven is elegant and correct and should put on a lovely productive udder with her genetics. Her dam easily milked almost 1600 pounds as a first freshener, giving Raven the potential to be a third generation star milker. Can't wait to see this girl mature! She is pictured right at 1 year of age. Raven was bred to Calvin for 2019 kids and had beautiful twins on March 19; a buckling and doeling. Her first freshening udder is well attached and wide at the top with nice capacity. Raven's first freshening udder just a few weeks fresh. This was a breeding we were really excited about as it merges the genetics of two of our favorite foundation does, Flirty and Puff. Tonks is out of Flirty's 2017 triplets, sired by Puff's son, Draco. Tonks has a beautiful strong topline and rump like her dam and should put on a lovely productive udder with her genetics. Can't wait to see this girl mature! Tonks was bred to Calvin for 2019 kids and she had flashy twins in March. Her first freshening udder is very nicely attached with well placed teats. Her quality udder milks out down to nothing very quickly. Her first milk test at just 13 days in milk as a first freshener shows her milking a respectable 6 lbs. 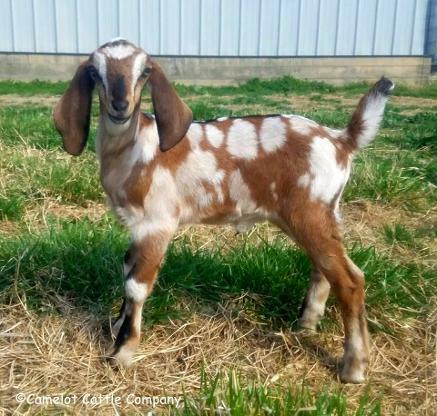 Tonks will be bred to +*B Sweet-Spring Calvin Klein for 2020 kids. This was a breeding we were really excited about as it merges the genetics of two of our favorite foundation does, Flirty and Puff. 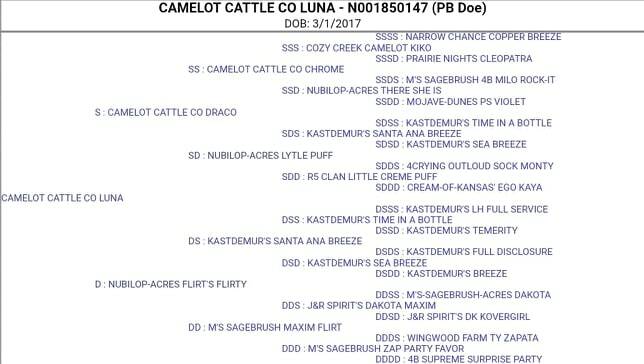 Luna is out of Flirty's 2017 triplets, sired by Puff's son, Draco. Luna has a beautiful strong topline and rump like her dam and should put on a lovely productive udder with her genetics. Can't wait to see this girl mature! Luna was bred to Tolkien for 2019 kids and she had a nice set of twins in March. Her first freshening udder is well attached with well placed teats. She milks out very fast and her quality udder empties to nothing. 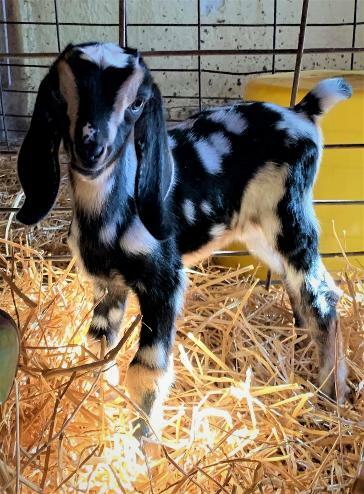 Harley Quinn is a long awaited doeling out of Flirty and Chrome born on March 6, 2018. We had done this cross before and gotten some lovely kids but we never retained a kid until this year. 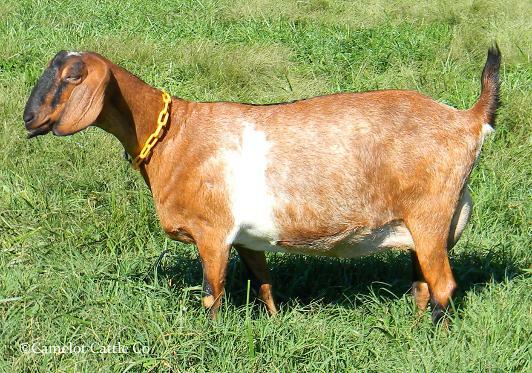 She is long and level and just a correct and lovely example of the Nubian breed. I am so anxious to see her mature and become part of our milking herd! Pictured above at about 7 months old. 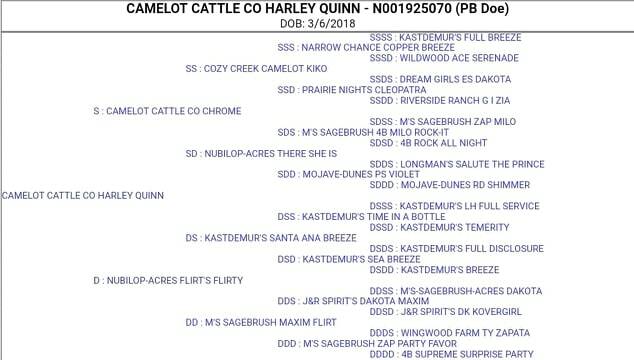 Harley Quinn will be bred to +*B Sweet-Spring Calvin Klein for 2020 kids. Harley Quinn at about 2 weeks of age. Phoebe and Charm are sweet little doelings out of MeMe's March 2018 quads. Their sire is M*L Legacy Sweet Sensation, full brother to the 2016 National Champion and Best Udder doe, CH Canoe Creek Victoria. MeMe is proving to be quite the producer, milking 12.2 pounds on her first 2018 milk test. MeMe milks out fast and has a wonderful soft, quality udder. These girls certainly have an impressive pedigree behind them and we are looking forward to seeing what these genetics can do in our herd. Pictured at about 7 months old. 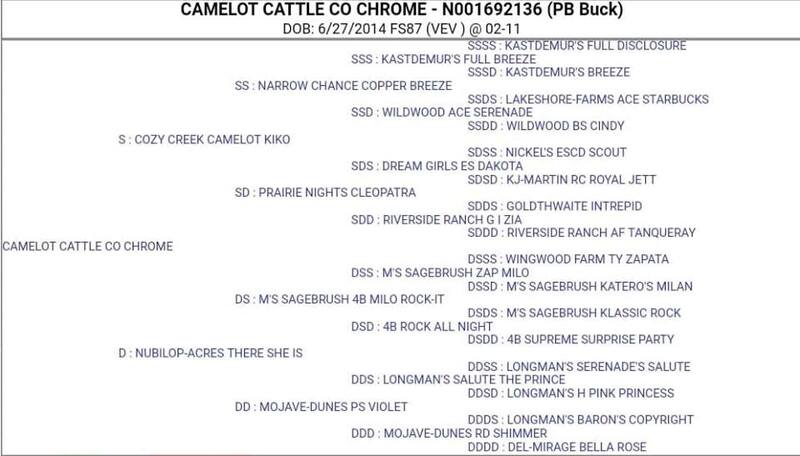 Phoebe will be bred to Camelot Cattle Co Chrome and Charm will be bred to Camelot Cattle Co Moose for 2020 kids. 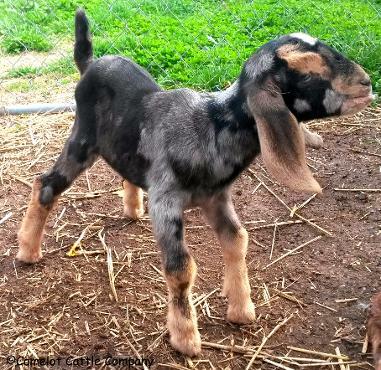 Phoenix was born March 12, 2018 and is a lovely, long, level doeling with correct build. Even as a newborn she commands your attention. She is simply elegant. Very much like her dam, Mischief, daughter of Flirty. She is sired by Draco, son of Puff. We are very excited to see what this doe does in our herd. She certainly has an impressive pedigree! Pheonix is pictured at about 7 months of age. 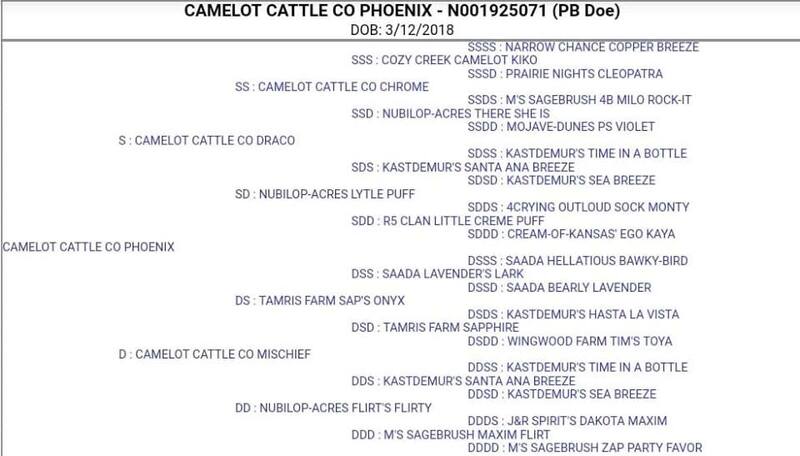 Phoenix will be bred to +*B Sweet-Spring Calvin Klein for 2020 kids. 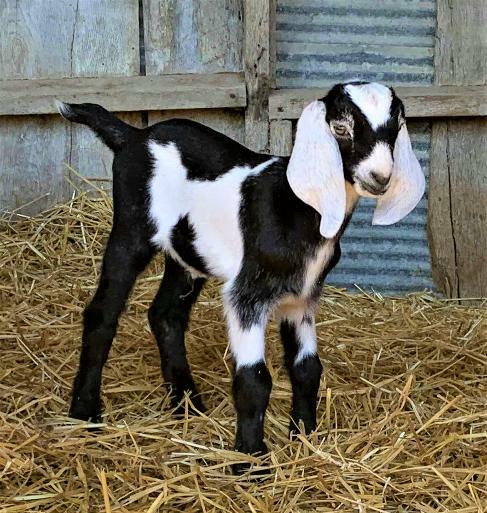 Charlie, born March 3, 2019, is out of our beloved Puff and sired by Moose, son of Flirty. 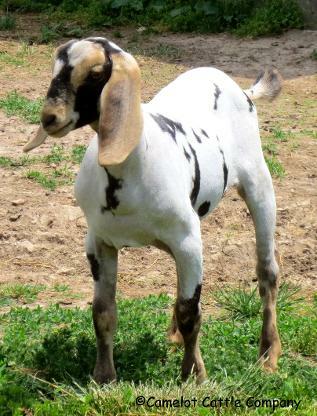 We are excited to add this lovely little girl to our herd! 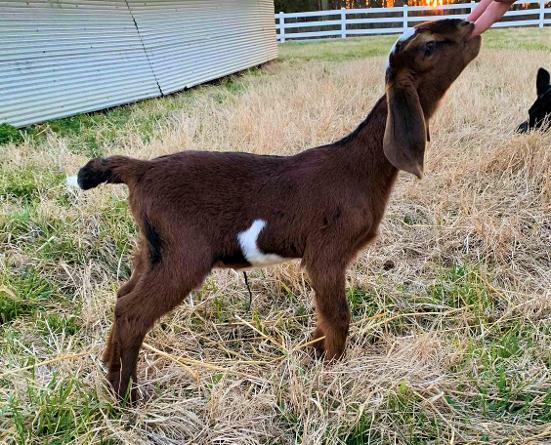 Ruby, born March 8, 2019, is out of the lovely MeMe and sired by Calvin. Her width and depth is impressive and her breed character is phenomenal! Looking forward to watching this girl mature! Pictured at 8 days of age. Amara, born March 5, 2019, is out of Flirty and sired by Onyx, making her a full sister to our wonderful Missy. Very excited to have her in our herd! Isabelle, born March 5, 2019, is out of Flirty and sired by Onyx, making her a full sister to our wonderful Missy. Very excited to have her in our herd! Tinkerbell, born March 9, 2019, is out of first freshener Fawkes and sired by Onyx. She was in a set of triplets that included a huge buckling and a good sized doeling that must have hogged all the womb space because Tinkerbell was only 4 lbs, 5 oz at birth. That has not slowed her down though, she was born with a huge, outgoing personality and good appetite that has enabled her to quickly catch up in size even to older kids. We are looking forward to seeing how she matures. Misha, born March 26, 2019, is out of first freshener Lily and sired by Tolkien. She is so lovely and elegant! We are excited about this sweet little girl! Pictured at just a few days old. We were very grateful when given the opportunity to add GCH +*B Sweet-Spring Calvin Klein EX91 to our herd in the fall of 2018. We had admired this buck and his progeny for years. Calvin is the son of the one and only GCH ++*B Kastdemur's Time in a Bottle EX90 ELITE and line bred on ADGA National Premier Sire SG ++*B Kastdemur's LH Full Service EX91. Calvin was a 2 x GCH as a 2 year old and GCH again as a 3 year old. He is a very tall buck with substantial strength, correct feet/leg and excellent topline. 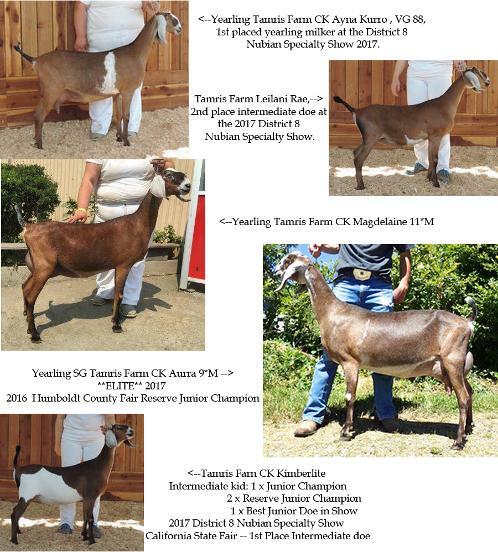 His daughters are proven both in the show ring and in the milk pail with Junior Champions, Best Junior Doe in Show, as well as Superior Genetics and 99% ELITE doe as yearling milkers. We can't wait to see what he can do for us! Calvin is pictured above at 4 yrs old. *Calvin's picture and reference pictures courtesy of Tamris Farms. We are very excited about having Onyx as a herdsire! We had him shipped in from Tamris Farm in northern California in June 2015. Onyx is a very big boy (200 lbs as a yearling) from very strong bloodlines. 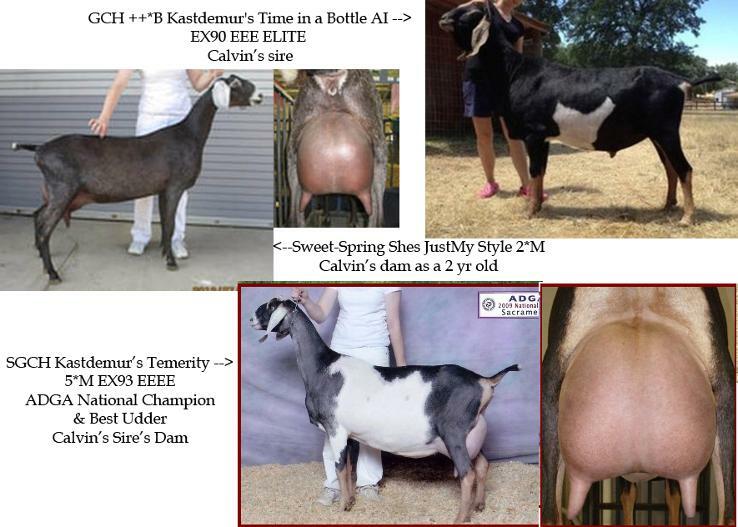 His dam is SGCH Tamris Farm Sapphire 10*M Elite Doe (top 99% of Nubian milkers) with an Ex 91 (EEEE) score. 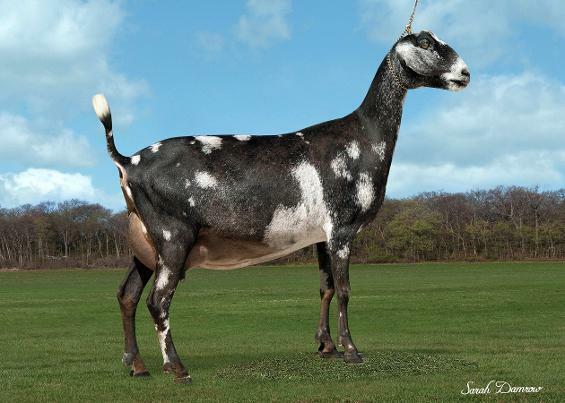 Sapphire has an impressive show record even with limited showing, being 2 X Reserve Champion as a Junior doe, 1 X Reserve Champion as a yearling milker and 2 X Grand Champion as a yearling milker. As a 2 year old milker she was 1 X Reserve Champion and 3 X Grand Champion and 3 X Best of Breed. As a 3 year old milker she was 6 X Best of Breed, 3 X Best Doe in Show, and 1 X Best Udder in Show. As a 4 year old milker she was 1 X Reserve Champion, 3 X Best of Breed and 1 X Best Doe in Show. She has an impressive DHIR record as well, as a 4 year old, on a 304 day lactation, she milked 3810 with 169 fat and 141 protein and in 2015, she milked 3820 with 212 fat and 146 protein. She is milking through 2016 and at 363 days in milk still tested at 8 lbs. Not only is she on the Top Ten list but she was #5 for production, #6 for butterfat, and #5 for protein in 2014. 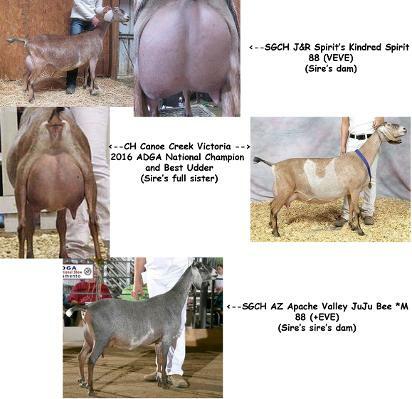 *Update on Sapphire, Onyx's dam: Sapphire made the USDA-DHIA Elite Doe list again as well as ADGA Top Ten again in 2015, this time as #1 in production, #2 for butterfat, and #3 for protein. What an impressive doe! 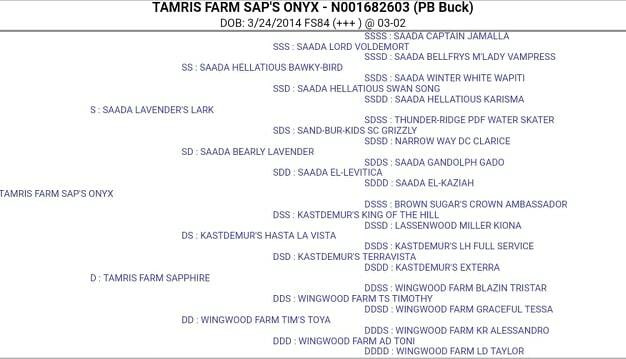 Onyx's sire is +*B Saada Lavender's Lark out of SGCH Saada Bearly Lavender 4*M herself with a Ex92 EEEE score. Lavender earned her first milking leg in 2007 as a yearling and as a second freshener scored Ex90 with an "E" udder! She is now Ex92 and has never yet been out of the top 5 at National Shows attended. She has been 3rd, 2nd, and 5th at three National shows. In 2010, 2012, and 2013 she was named INBA's All American of her age group for the previous show year. Talk about some amazing bloodlines! We couldn't be happier! 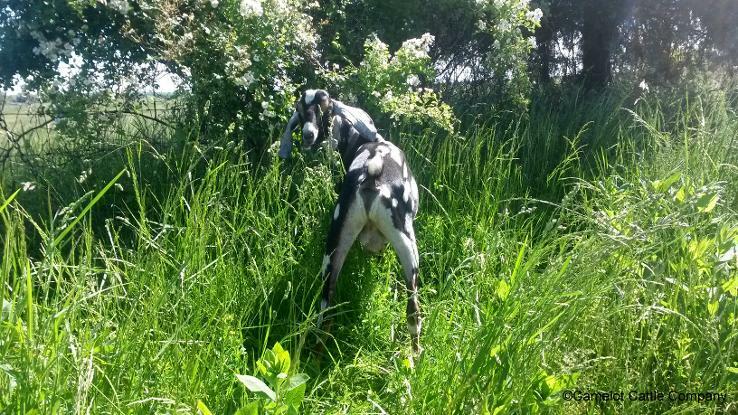 And all that wrapped up in a big, gorgeous package of black and white spots, those dreamy solid black ears and his sweet puppy dog temperament...what more could a person want in a herdsire?! 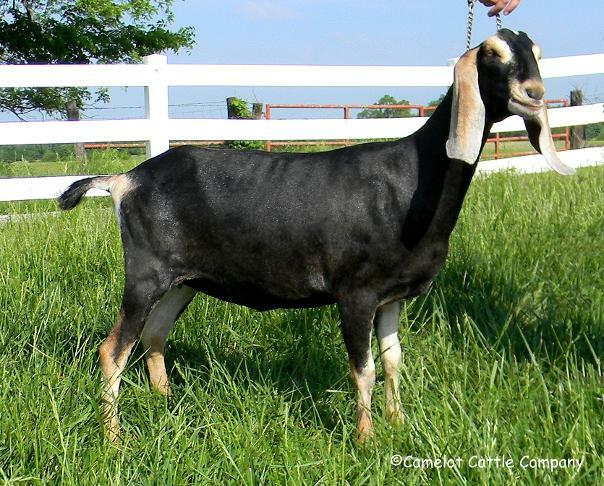 Onyx is pictured as a yearling. At the 2015 Nationals, Onyx's maternal sister placed 7th in a huge class as an intermediate kid. 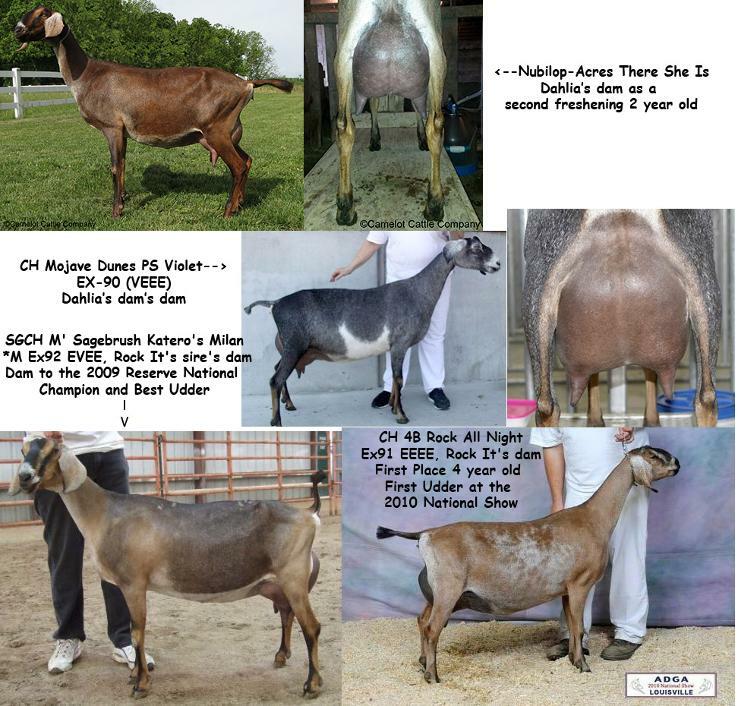 Onyx's paternal sister, Naberrie, placed 7th in 3 yr old milkers, 5th in produce of dam and 5th in dam/daughter. 2016: Onyx appraised +84 with a VG in Dairy Strength (+V+) and with the appraiser's comment that as tall as he is (50 in Stature because he is 2 inches off the charts), that it may take a little time for him to grow into himself. We are looking forward to seeing his progress in the next year or two! 2017: Onyx appraised wtih Very Good Front Legs and Feet with a Final Score of 84. Unfortunately ADGA wasn't able to accommodate our herd for the 2018 season so we don't have new linear scores this year. 2018: Onyx's first freshening daughter in our herd, Mischief, is projected to milk 3500 lbs making her a possible Top Ten contender her first lactation and she has a gorgeous, socked-on udder to boot! Chrome was born June 27, 2014. 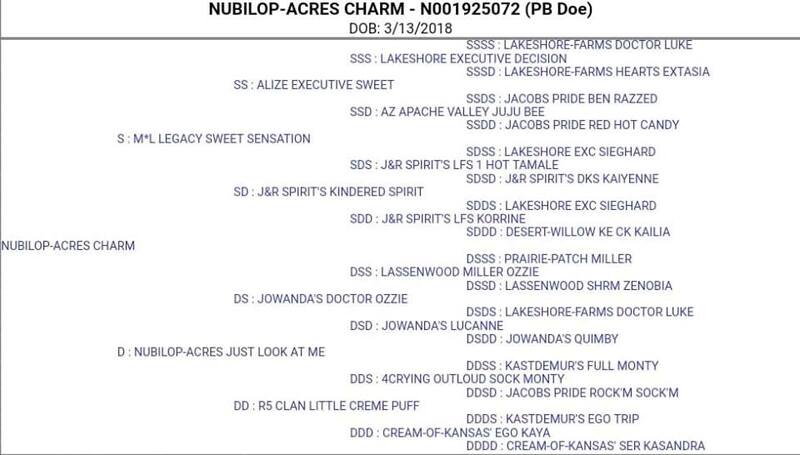 He is sired by Kiko and out of Nubilop-Acres There She Is. Chrome has moonspots and splashes all over that gorgeous black with brown trim. Not only is this boy fancy, he is also correct with very good legs, feet, and shoulder assembly and nice breed character. He has wonderful length, depth and width everywhere, with a strong level topline and long, wide, level rump. He has pliable skin, sharp withers, fantastic spring of rib, and impressive body capacity. Adding in his wonderful genetics with his EX90 sire and his dam's fantastic udder and milking ability (10+ pounds per day as a 2 year old)--we couldn't do anything except retain him as a herdsire. Pictured above as a yearling. Now that he has had a couple kid crops on the ground, we are quite justified in retaining him as he is really making some super nice kids! I have no doubt his daughters will be putting on some great, productive udders. 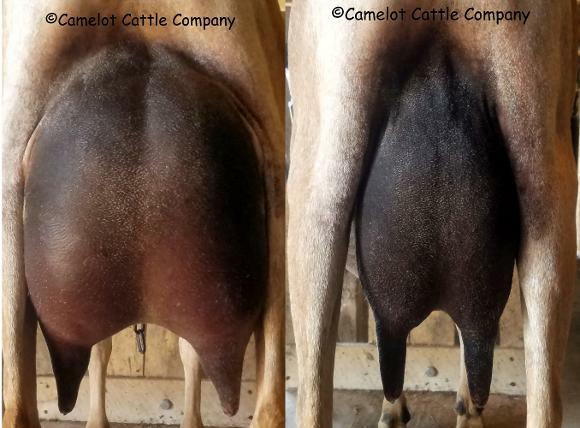 Chrome's littermate twin sister, Camelot Cattle Co Nutmeg, freshened as a 2 year old with a beautiful, productive udder (her udder is pictured below in Chrome's reference section). 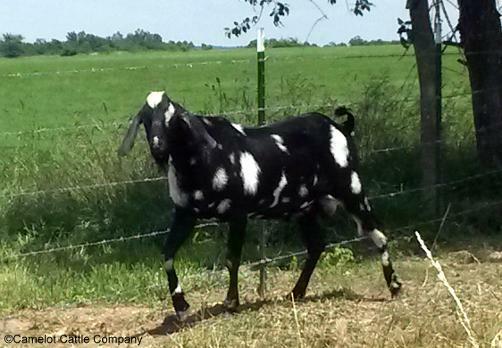 Nutmeg's owner says, "Nutmeg freshened for the first time in March  with triplet doelings. She is doing an outstanding job, feeding them, and sharing with me as well! Nutmeg is a laid back, easy keeper, but obviously hardworking. I can't say enough good things about this doe." 2016: Chrome appraised VG85 (V+V) as a yearling. 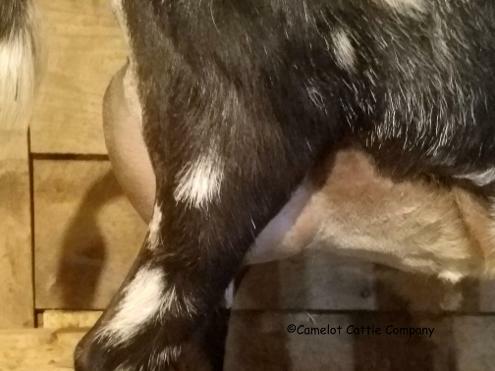 2017: Chrome appraised with Very Good Head, Shoulder Assembly, General Appearance, Body, Front Legs and Feet, Excellent in Rear Legs and Dairy Strength with a Final Score of VG87 (VEV). 2018: We have retained 4 daughters and two sons up to this point sired by Chrome. We are just ecstatic with what he is producing for us. Unfortunately this year, when Chrome is looking better than ever, ADGA wasn't able to accommodate our herd for the 2018 season so we don't have new linear scores this year. We were very fortunate to be able to add this buck to our herd. 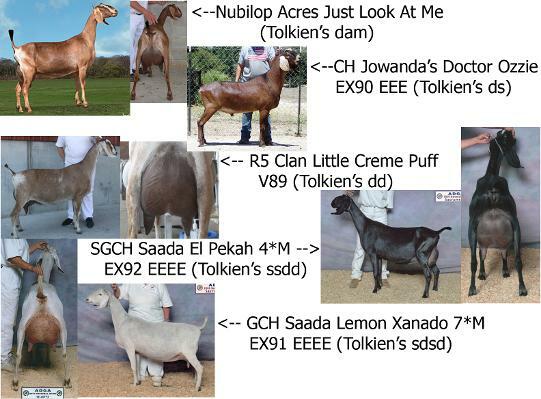 Tolkien combines the genetics of some of our favorite goats such as R5 Clan Little Creme Puff, Saada El X-travaganza, and Saada El-Marah, daughter of Saada El-Pekah. He is a very strong, very correct buck with dairy skin and beautiful breed character. He has a strong topline going into a strong, wide, level rump and with his genetics I expect to see some fantastic mammaries from his daughters. He is pictured here as a yearling. 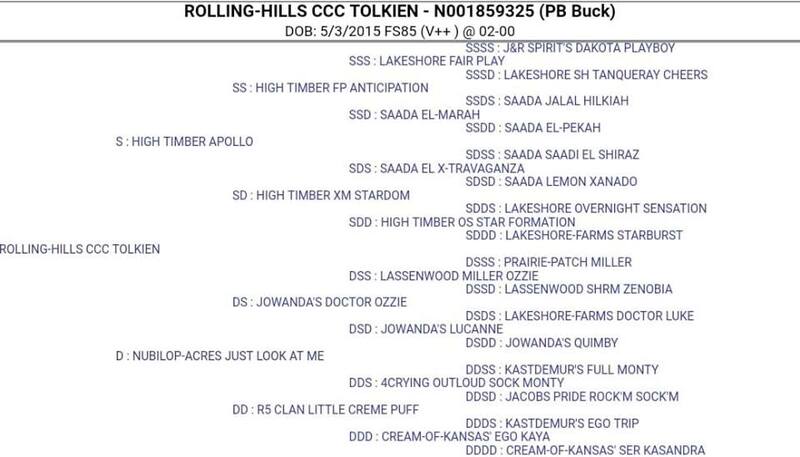 Tolkien's dam with very limited showing as a 3 year old in 2017 was Res. Sr. GCH at the SMDGA show and Res. 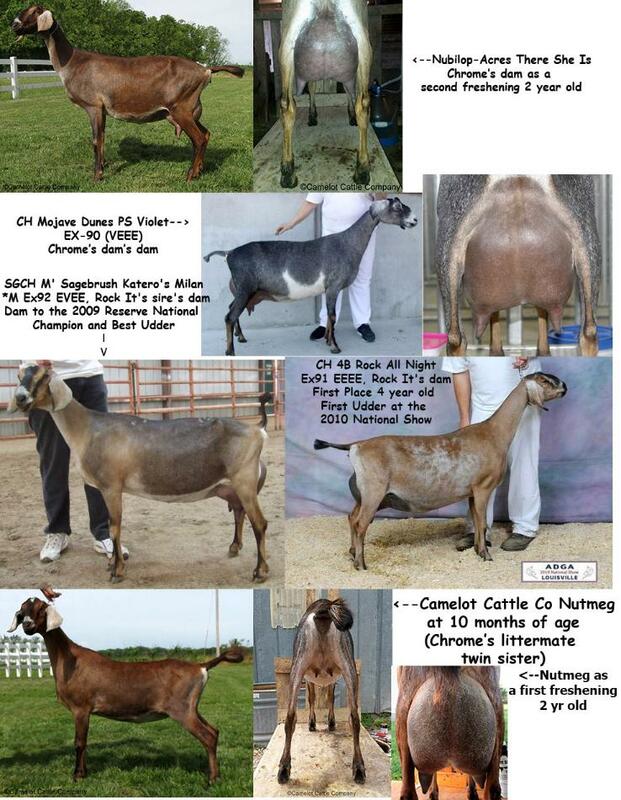 Sr. GCH at the Quad State Classic Dairy Goat show. 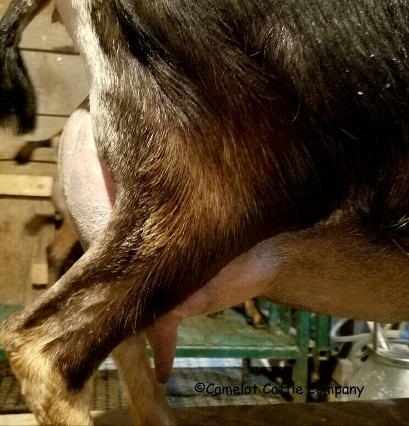 She has a lovely mammary with well-placed teats and wonderful dairy quality and quite the producer, milking 12.2 pounds on her first 2018 milk test. Tolkien's 2017 appraisal shows him with a Very Good Head, Front and Rear Legs, Feet, and General Appearance with a Final Score of 85. Moose is a long awaited buckling out of Flirty and Chrome. We always get lovely kids from this breeding. We are looking forward to utilizing him in our breeding program as early as this fall. 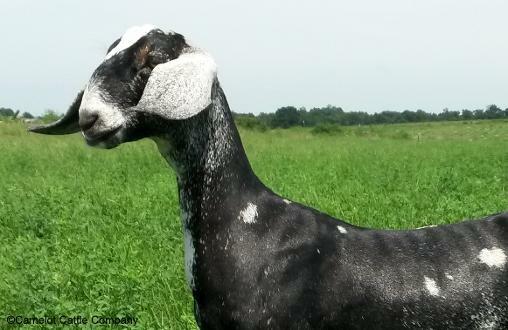 He is a wonderful example of a Nubian kid with width, depth, and strength a good dairy goat needs to support production. He is very correct with a lovely topline and rump and impressive body capacity even as a kid. He should make some super nice kids with his fantastic genetics. 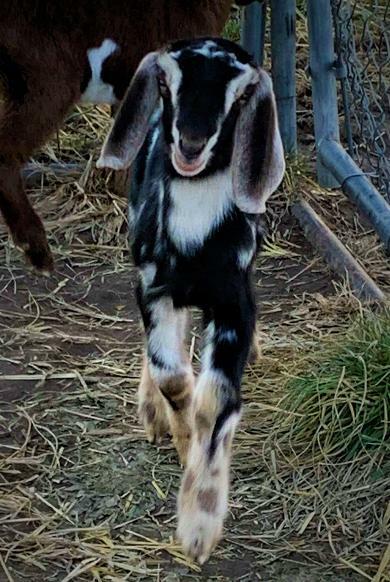 Dante, born March 8, 2019, is out of our wonderful Missy and sired by Calvin. 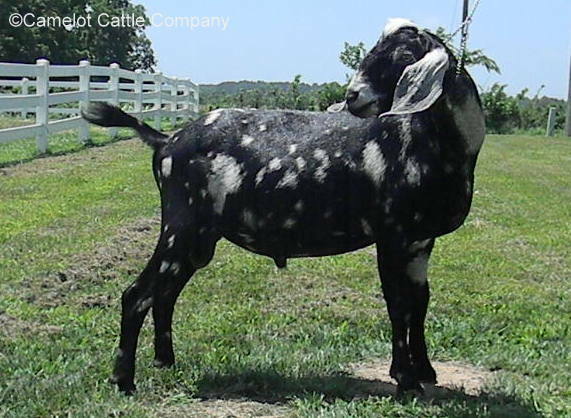 He has a smooth, level topline and lovely breed character. He should bring impressive production and type to his progeny. Mordecai, born March 5, 2019, is out of Flirty and sired by Onyx, making him a full brother to our lovely Missy whose 2018 305 ME was over 3500 lbs as a first freshener. Mordecai should bring production and type to his progeny. He has impressive width and is very correct. 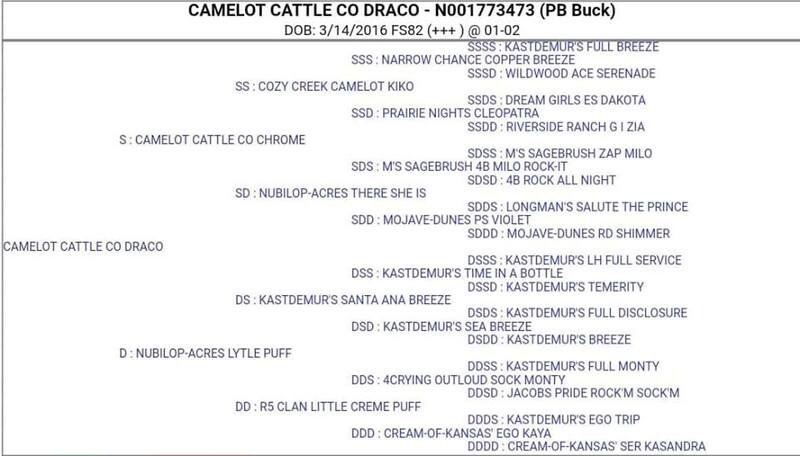 Draco is exactly what we were breeding for when we paired Lytle Puff and Chrome. He was born March 2016 in a set of triplets. He is long, level, correct, with long, elegant ears and nice head. He has pliable dairy skin, open flat ribs, natural wide stance and open escutcheon. With his dam's fantastic udder and production behind him and his sire's production and udders backing that up, he is simply exemplary. 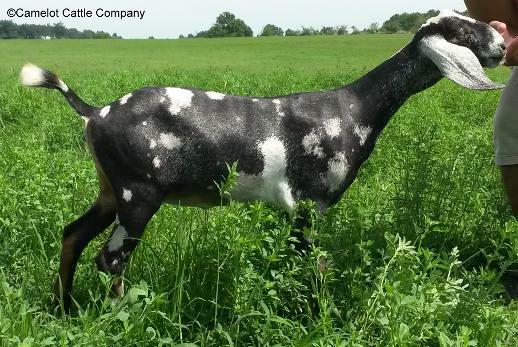 And, just to top that off, he is absolutely covered in moonspots and splashes for the wildest colored goat we've had yet! Our only regret is that Puff had triplet bucklings and didn't give us any doelings! We will repeat this breeding to try for a doeling to retain! Pictured above as a yearling. Draco sired his first kids in 2017...a beautiful set of triplets out of Flirty including two doelings we are retaining...very pleased with what he produced! His 2017 appraisal shows Very Good Front and Rear Legs and Excellent Feet with a Final Score of 82. Draco went to work in a new herd as of 2018 but we retained one last Draco daughter out of Missy's 2018 litter and are really looking forward to seeing what his three daughters can do in our herd. Pictured below at about 7 weeks of age. 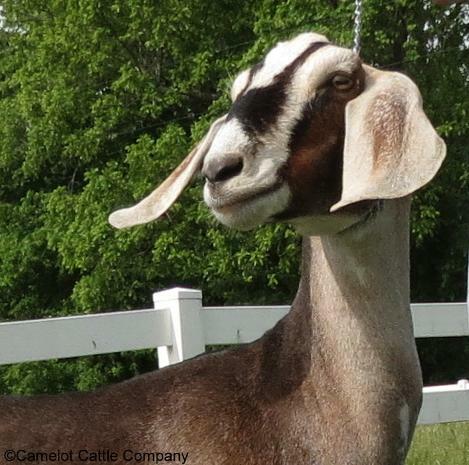 Kiko is an exceptional buck with a gorgeous roman head and fantastic long bell shaped ears. He is very big, strong, and very open ribbed and deep bodied with a beautiful brisket. He has the widest, highest escutcheon I have ever seen, so round at the top...his daughters will have plenty of room for wide, high udders! As strong as he is, there is no doubt it is dairy strength with his pliable skin, flat bones, and sharp withers. He has an outgoing and very friendly personality, very affectionate and easy buck to handle. He was born March 23, 2013 in a set of twins out of Cleo and Copper. 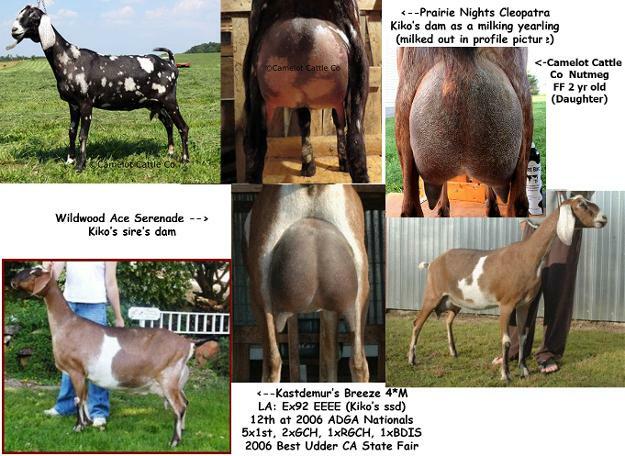 Cleo's dam scored excellent in mammary and dairy strength and Copper's sire scored EX-91. Kiko is pictured above as a yearling. Kiko has put some fantastic, correct, promising kids on the ground. Kiko's twin sister freshened as a 2 year old with a beautiful, well-attached udder, high and wide and well-placed teats. Kiko's first daughter to freshen is a full sister to our other herdsire Chrome and she has a beautiful, productive udder with good attachments and well-placed teats. We are very pleased with what Kiko is producing! 2016: Kiko appraised EX90 with Excellents in shoulder assembly, legs (front and rear), back, and general appearance (EVV). Eclipse was born March 16, 2015 to our wonderful Lytle Puff and sired by handsome Kiko. We knew immediately she was staying here. 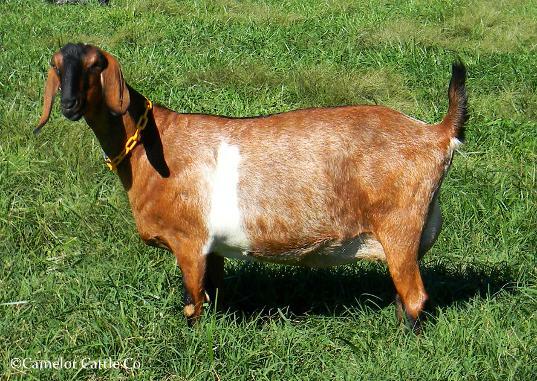 She shows every sign of being our ideal kind of goat. 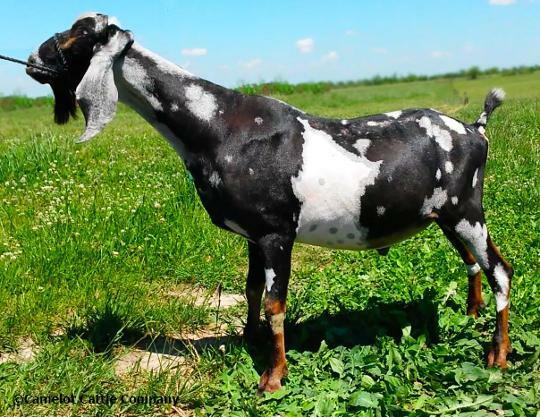 The width and depth she has everywhere is incredible and her breed character is impressive...just look at that huge roman nose and beautiful bell shaped ears! She has a nice level topline going into a very good, wide rump and wonderful body capacity. Eclipse is tall and strong in a gorgeous black roan with tan trim and two hidden white spots on her belly...a person can't help but notice her! She doesn't have much chance with her pedigree to not put on a great udder so we are very excited about this addition! Pictured as first freshening 2 year old. Eclipse was bred to Onyx and had beautiful triplets on March 2, 2017. Her first freshening udder has surprising capacity, good attachments and lovely, long foreudder. 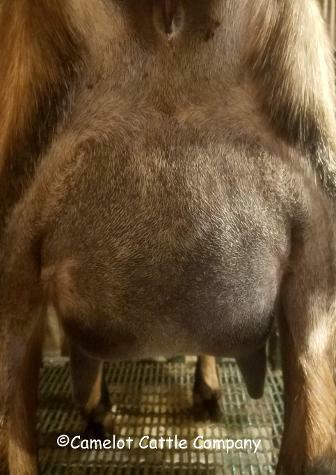 She milks out easily with a warm butter udder texture and just a few weeks fresh she is milking 8 pounds as a first freshener. She also easily qualified for her milk star in milk, fat, and protein as a first freshener. Eclipse had two doelings and a buckling. One doeling is being retained. Eclipse's 2017 appraisal shows mostly Very Good structural traits with Excellent Rear Legs and Feet and a Final Score of 84. Eclipse's first freshening udder in March 2017. Prov 27:27 "And thou shalt have goats' milk enough for thy food, for the food of thy household, and for the maintenance for thy maidens." Isaiah 40:11 "Like a shepherd He will tend His flock, In His arm He will gather the lambs and carry them in His bosom; He will gently lead the nursing ewes.